I live and teach in Virginia, one of many states that requires the Pledge of Allegiance be recited by public school students every day. According to the law (as I know that may be tough to read), school boards must require the daily recitation and display of the flags in all classrooms. However, “no student shall be compelled to recite the Pledge if he, his parent or legal guardian objects on religious, philosophical or other grounds to his participating in this exercise.” I’m not sure if this means students can only not participate if they have some reason they can express for that choice but I will say I have never forced a child to say the pledge in my classroom. I should also note that it has been rare that students have not just automatically stood up and recited the pledge. I’ve been thinking about this a lot lately for some reason. In my first few years of teaching my school did a morning news show and the pledge and minute of silence were a part of it. Then we dumped the news show because of the amount of instructional time it was taking and teachers did the pledge and minute of silence on their own. Which meant they didn’t happen in my classroom. I don’t feel strongly against either, but also don’t really see the value and so didn’t prioritize them. Last year my school started a morning news show so the pledge is back in my daily routine. There is much I like about the way our morning news show is done so this is just fine with me. I have, however, noticed that the way I personally deal with the pledge has shifted. In my first few years of teaching I recited the pledge with my hand over my heart. I’d done it as a student for thirteen years and so continued doing so without much thought. In recent years both of my daughters’ schools did the pledge and they shared their thoughts. They both stand and recite the pledge but don’t say ‘under God.’ Their father is a historian and they are aware of the complicated history of those two words, which were not added to the pledge for many years. They also both have strong feelings about the separation between church and state and, so, have chosen not to say those two words. For a bit I followed their lead (as I often do – they teach me so much). I stood with my hand over my heart and said the pledge, omitting those two words. Then I gradually began standing with my hand over my heart but saying nothing. Reciting the pledge every school day for the thirteen years I was a student and now for nearly a decade of my teaching career (as there were those years it didn’t happen) it has no meaning for me. Repeating it is something I’m doing only because it is what we are all doing. I feel no need for that. I try hard to have a why for the things I do in my classroom and I can’t find a good answer for myself for why I should say the pledge. So I stand quietly, respectfully, and look at the flag during the pledge. Last month we buried my grandfather in a military cemetery and had a full military funeral. 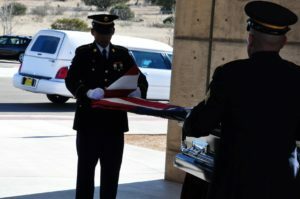 He served several years in the army during WWII (luckily he was young and entered the military near the end of the war and never saw active fighting). My father also spent several years in the army, his stint during the Vietnam War. He was also lucky and spent his time being trained in Russian and living in remote Alaska translating radio messages. I feel immensely lucky to have been born in this country. I vote in every election (and I do mean every – primaries, local, state, and federal). I believe in the United States, the power, the potential of this country. I just don’t believe requiring the recitation of a pledge of allegiance is meaningful. I run he morning show. I now have a video opening with moment of silence and pledge. The slide before the pledge says that you “may” now stand. And it just shows a flag with the words scrolling. So they can follow along or not. I know we have some Jehovah’s Witness kids who sit out and I try to make it as cool for them as I can. I also don’t like it myself so am happy that running the show gives me an excuse not to have to do it.